A young mother and a toddler in a stroller are both dead after some street racers ran them over near the intersection of Bayshore Boulevard and West Knights Avenue. Three people have been charged. According to police and witnesses, an 18-year-old in a Mustang was racing against a 17-year-old man in a Nissan. Reportedly, the cars were travelling at speeds exceeding at least 60mph on the quiet street – and perhaps as fast as 100mph. Both victims were lawfully within a pedestrian ramp when the Mustang hit them. The “tragic crash. . .didn’t need to happen,” opined Kim Degance, President of the Palma Ceia Neighborhood Association. “It could have been avoided,” she added. In what may qualify as “too little too late,” city officials said they would lower the speed limit on Bayshore from 40mph to 35mph effective immediately. Vehicle speed is by far the leading factor in Tampa pedestrian accident fatality cases. 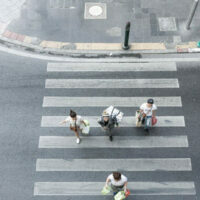 If the tortfeasor (negligent driver) is travelling under 30mph, the pedestrian fatality rate is less than 10 percent. But there is a very narrow window. The fatality rate skyrockets to about 90 percent at 40mph. Head Injuries: Pedestrians have no crash helmets or restraint systems to protect their heads and necks. The sudden motion alone is often sufficient to cause a serious head injury. When a trauma injury accompanies the motion injury, the results are almost always catastrophic. Exsanguination: Blood loss from both internal and external injuries often sends victims into hypovolemic shock. It is not unusual for pedestrian accident victims in Florida to lose as much as a third of their blood, or even more than that. Broken Bones: Although these injuries are usually not life-threatening, the serious fractures that these wrecks cause usually impair mobility for months or years after the accident. Essentially, the victim is unable to perform even simple, routine tasks while these injuries heal. If the pedestrian suffered a serious injury, and that’s nearly always the case in Tampa, damages include compensation for both economic losses, such as medical bills, and noneconomic losses such as pain and suffering. DUI: Even if the tortfeasor (negligent driver) is unable or unwilling to perform field sobriety tests and/or give a chemical sample of breath or blood, it’s still usually possible to establish liability in DUI-related crashes. Reckless Driving: This statute is very broad in Florida. It could apply to almost any crash that involves a serious injury. Legal doctrines are available which ensure compensation to victims. For a free consultation with an experienced personal injury attorney in Tampa, contact The Matassini Law Firm, P.A. We have two offices in the Tampa/Volusia County area.